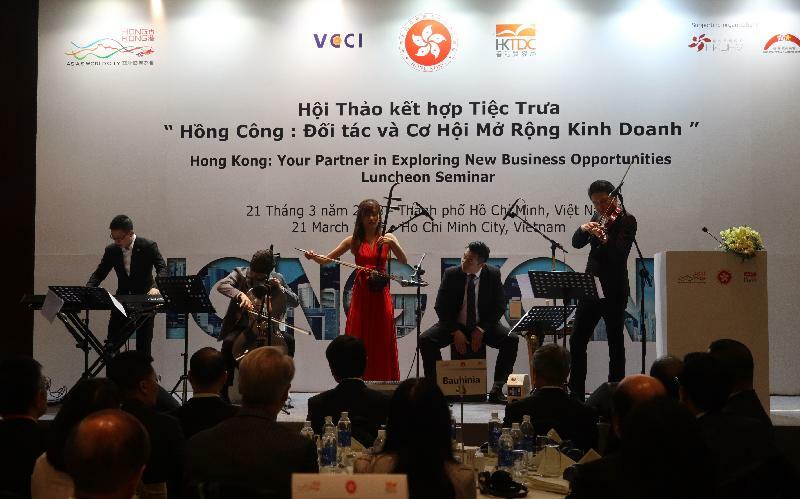 Hong Kong is well-placed to be the gateway, springboard and crucial link in all ventures under the Belt and Road Initiative if Vietnam sees it as a source of opportunities for more trade and joint investment in infrastructural development and stronger collaboration on other economic and social development fronts, the Secretary for Commerce and Economic Development, Mr Edward Yau, said at a business luncheon seminar entitled "Hong Kong: Your Partner in Exploring New Business Opportunities" in Ho Chi Minh City, Vietnam, today (March 21). The seminar was co-organised by the HKSAR Government, the Hong Kong Trade Development Council and the Vietnam Chamber of Commerce and Industry. Speaking at the seminar, Mr Yau said, "In seizing the immense opportunities emerging from the Belt and Road Initiative, Hong Kong's expertise is best displayed in its ability to strike deals between countries along the Belt and Road corridor. 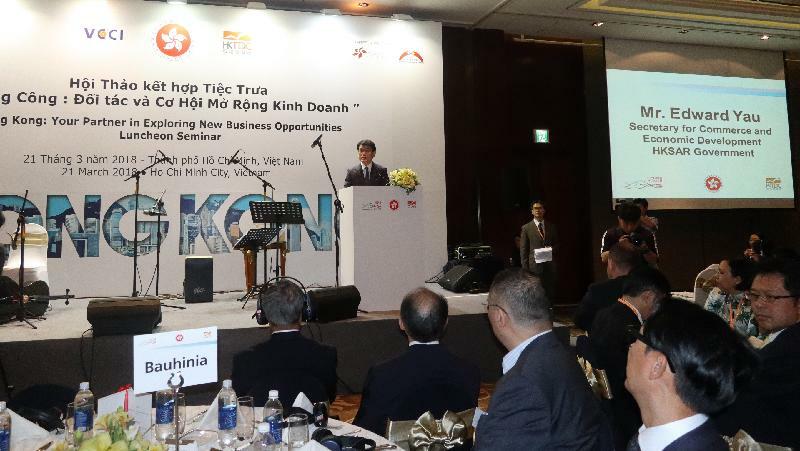 Being an international financial, trade and logistics centre well-versed in cross-boundary transactions and projects, Hong Kong stands ready to partner with Vietnamese enterprises in grasping these opportunities. "Typical services required in mega infrastructural investment projects include project financing, risk assessment and management, legal services, accounting, insurance, building, construction and architectural services, and last but not least, arbitration and dispute resolution advice. All these services are readily available and can be expertly provided in Hong Kong," Mr Yau added. According to the Asian Development Bank, as much as US$1.7 trillion per year is needed for infrastructure development in Asia until 2030. In terms of trade volume, it represents US$10.9 trillion's worth of business just in 2016. "Professional sectors operating in Hong Kong are highly specialised and sophisticated, serving the Asian markets. Irrespective of their background as global firms or as home-grown companies, professional services in Hong Kong pride themselves on their knowledge of business at the local, regional and international level, and they maintain high and international standards. For us, the Asian market is so important that no one can afford to miss out and there is no better place than Hong Kong as a regional hub for professional services for this fast-growing market," he said. 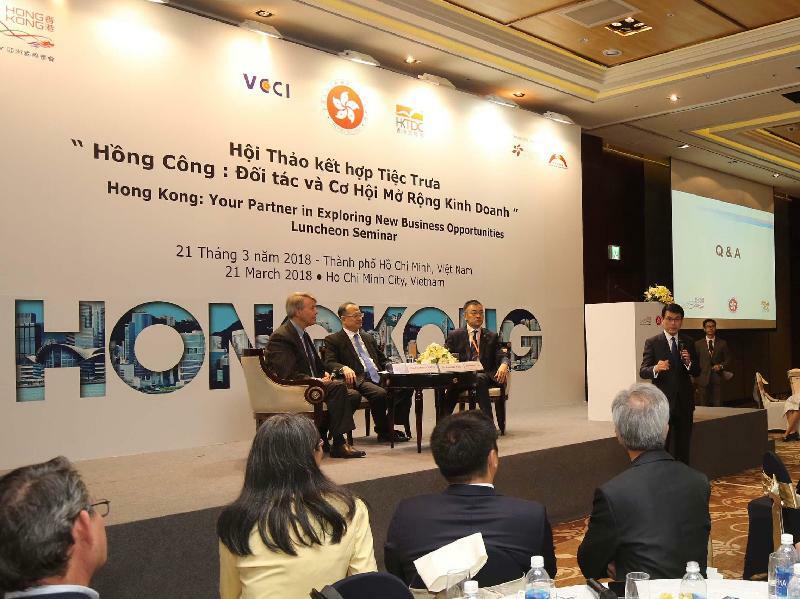 Mr Yau described to about 240 participants, including local business leaders, the attributes that have earned Hong Kong its status as the world's most competitive economy and freest economy for more than two decades. These include its unparalleled advantages under "one country, two systems"; greater access and easier inroads into the world's biggest and fastest-growing market through the Closer Economic Partnership Arrangement (CEPA) with Mainland China; a legal system premised on the common law system; an international convertible currency; the free flow of capital and information; talented people offering business and professional services that are benchmarked with international standards; and most important of all, a secure business environment, together creating a trusted partner one can always count on. In 2016, Hong Kong was Vietnam's ninth largest trading partner, fifth largest export market and 17th largest source of imports. Bilateral trade in goods amounted to US$18 billion in 2017, representing a remarkable increase of nearly 12 per cent over 2016. Trade in services amounted to US$800 million in 2015, representing a year-on-year increase of 7.3 per cent, while the average annual growth in bilateral trade in services was over 9 per cent from 2011 to 2015. 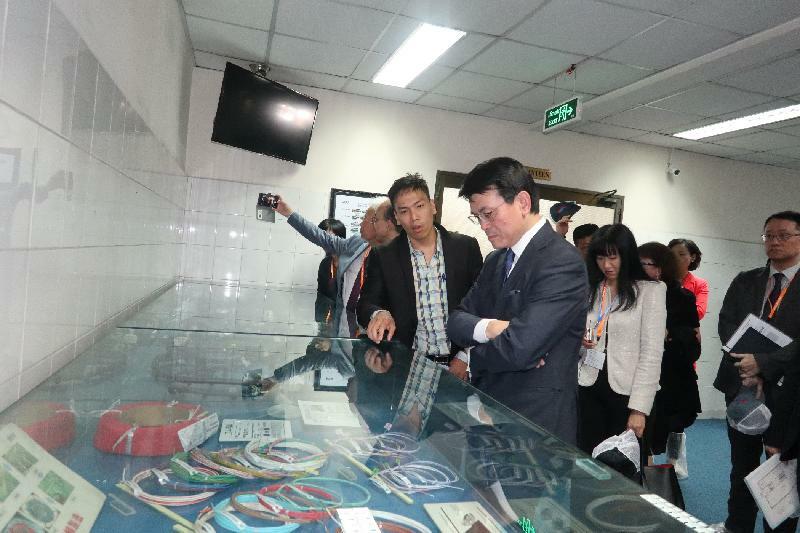 Before the seminar, the delegation met with representatives of the Ho Chi Minh City Export Processing and Industrial Zones Authority and toured the industrial park there to learn about the latest industrial developments in Vietnam. Established in 1992, the Authority is currently administering 17 industrial zones and export processing zones in Ho Chi Minh City, with over 1,500 enterprises and employing some 290,000 workers. In the afternoon, the delegation attended a briefing given by the Investment & Trade Promotion Center of Ho Chi Minh City. The Center is a government agency specialising in facilitating investment and trade. Its main services include providing one-stop services to foreign investors in identifying investment projects, fulfilling regulatory requirements, as well as providing necessary information on trade and investment. The delegates were briefed on the latest investment situation and incentives of the city. 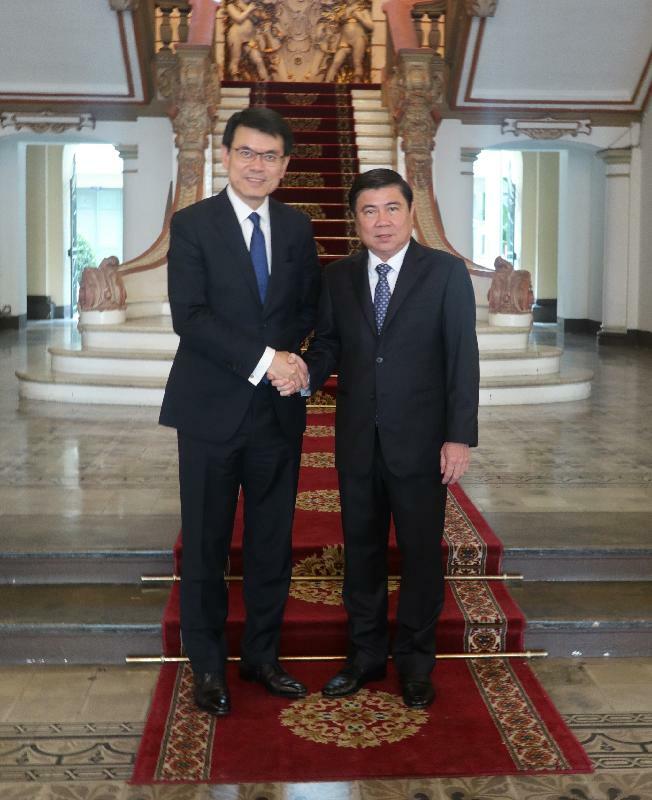 Mr Yau then met with the Chairman of Ho Chi Minh City People's Committee, Mr Nguyen Thanh Phong, and exchanged views on strengthening ties in trade and investment between Hong Kong and Ho Chi Minh City. Later, Mr Yau will call on the Chinese Consul General in Ho Chi Minh City, Mr Chen Dehai. Meanwhile, some delegation members met with representatives of the Vietnam Trade Promotion Agency, which is a governmental organisation responsible for state regulation of trade and investment promotion for development of industry and trade. The delegates will also have a dinner with Chinese and local businessmen in Ho Chi Minh City. The delegation will continue their visit to Ho Chi Minh City tomorrow (March 22), including attending a briefing given by the Investment and Industrial Development Corporation.